You want to know why and how to drain the compressor tank? Every time you use your air compressor, it is inhaling free air. That free air contains water vapor. As the air pressure in the tank increases, the amount of air crammed into each cubic foot of space inside the tank increases too. The end result is that the water vapor in the air compressed into the tank increases in relative humidity so much that the water vapor quickly condenses into free water in the bottom of the compressor tank. Fill Your Compressor Tank With Water? Run your compressor long enough without draining the tank and you will completely fill your air tank with water. Then you will be pumping water into your air lines instead of compressed air. Every compressed air tank will have a drain valve, since every compressor tank will have to be drained regularly. The drain will typically be located in the lowest part of the tank when the compressor is sitting in its designed position. The odd compressor tank may have a drain on the side of the tank. Inside the tank, that drain valve will be connected to a line that extends to the lowest section of the air tank. Air pressure in the tank will drive water out that line even though the drain valve is not at the bottom. No compressed air in that tank? Then it will not drain. Run the compressor until you see pressure rising on the tank gauge, then open that drain valve to void water. I don’t much like the side-drain style as when crud builds up in the bottom of the tank, it can block the drain line, and prevent expulsion of water. Just another maintenance thing to be concerned about. At least the side drain valves are easily accessible to remove and clear the clogged line, once the tank is empty of air, of course. In the typical compressor drain, and since gravity works, the water that condenses all over the wall inside your air tank will then flow to the lowest spot in the tank, so that is where they put the drain, clever designers that they are. Just make sure you use it regularly. What does the typical tank drain look like? All of the manual air tank drains that I have seen have a common appearance. You can see one in the photo below. One type of compressor tank drain. I suppose your auto drain might look a little different from the one in the photo, but do not let that worry you. They all work in the same manner if they are a manual tank drain. 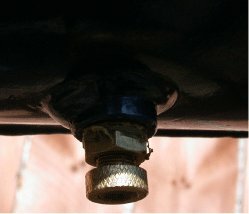 How Do Tank Drains Work? You see the knurled ring at the bottom of the drain valve in the photo? That ring is knurled (has bumps on it) to provide a gripping surface for your fingers. You turn that ring in a counter-clockwise direction (at least on mine, yours may turn the other way) to open the drain, and turn it the opposite way to close it. When you drain your compressor tank, open your drain valve all the way. If you just open the drain a little you will hear air starat to escape, and then it might stop, or burble. You may think the tank is drained. What has really happened is that the water or debris in the bottom of the tank has blocked the drain. The tank is not empty of water at this point. Open the tank drain all the way and be sure to void the entire tank of water. What Drains Out Is A Surprise! Get ready for a surprise! The stuff that flows out of your tank will be water…yes, and it will also contain residue of compressor oil, perhaps a smidgen of tank rust, all spiced with whatever dust migrated into the tank through the intake filter. The water draining from your tank may be thicker than expected and brownish in color. You do not want to drain the compressor tank onto something you don’t want stained. Perhaps your garage floor? Once the water from the tank has evaporated, it does leave a stain. Just be aware. I wear a pair of work gloves when I open the drain valve on my compressor tank. I do not need or want that gunk all over my hand, which will happen if you do not wear a glove with the hand that is opening the tank drain. When To Drain The Compressor Tank? As a general rule, drain the compressor tank after every use. As soon as you compress air you have water in the tank. If you do not drain that water it starts filling the tank, and at the same time, could start rusting the tank from the inside, depending on the tank inner coating that is applied to the interior of the tank at the factory. These days the compressor tank factory is probably in a different country, the metal used in tank construction might be recycled pop cans, and the quality of the coating inside a compressor that retails for $100 is pretty suspect. Drain your tank after every use. Slow down the eventual rust through that is the potential with every low cost compressor air tank. I generally leave my tank drain open until I go to use the air compressor again. Some folks do not. It just seems logical to me to allow outside air access (yes, I know it’s limited, but there is some air movement) to the tank to help dry it out. But, do not forget to close the drain when you next go to use your compressor. These DIY type air compressors are very loud, and you may not hear the air you are compressing busily exiting the tank as it is being compressed, right through the still-open tank drain. If your compressor will not build air pressure, that is one of the first things to check. How To Drain The Compressor Tank question? Please add it here, and please add photos to help us help you!